Hockey fans the world over know the custom when a player on the home team scores at least three goals in one game: the instantaneous doffing of different varieties of head gear and a strong throw in an attempt for the accoutrement to reach the ice in recognition. But what about when the opposition scores a hat trick, and the player who did it used to play in that city not two weeks before? John LeClair found some space in front, corraled a rebound from Eric Lindros, and beat Habs goaltender/future Hall-of-Famer Patrick Roy only 73 seconds into the third period and the Flyers took a 4-0 lead over the Canadiens. The burly Vermonter pumped home three of his club's four markers to that point before the curious occurrence unfolded. "I'm not going to ask questions, I think I'm just going to keep going with it. Playing on the line, I've gotten a lot of loose pucks. Things have been bouncing for me right now. I hope they'll stay that way," LeClair said to the Inquirer after his team finished off the largest rout by shutout in their history against Montreal, a 7-0 thrashing at the famous Forum 20 years ago tonight. Only 16 days prior, Flyers GM Bob Clarke engineered what would be considered the steal of either of his tenures in the club's front office, taking Eric Desjardins, Gilbert Dionne and LeClair off old nemesis Serge Savard's hands and only coughing up a bit of offense in Mark Recchi. This was the first time all four would face off against each other in different uniforms. "It's kind of weird," said LeClair, who grew up 90 miles south in St. Albans, VT. "You get accustomed to it for four years now, and when you come back, everything's familiar. But that's all going to change. We're still good friends -- those guys on the other side. But you've got to put that aside and play hockey." Until this Saturday night on Rue Ste-Catherine, LeClair -- he of the NHL record back-to-back overtime winners on the road in the 1993 Stanley Cup Finals for the Habs -- played six games for Terry Murray. In that time, he picked up five goals and six assists while recording his first career hat trick (and a career-best five-point night) at Tampa Bay on Feb. 14. But, well...this was Montreal and a chance for all three players to show Savard and 17,800 partisan patrons how much of a mistake he made. In the Flyers' only other appearance in town, back on January 29, the Flyers ground out a 2-2 tie with Lindros playing while visibly ill, prompting crusty veteran Craig MacTavish to grouse: "the biggest decision Eric had to make today was which end of his body to put on the toilet." Heading into this Hockey Night in Canada tilt, the Flyers were coming off a 6-6 tie in Quebec City where the flashy Nordiques wiped out deficits of 2-0, 3-1 and 6-3 despite a Lindros hat trick and 10 points from the as-yet unnamed top-line trio which didn't play the whole game together. As a result, the internal powder keg was ready to explode and serendipity provided the proper location. Left out to dry by teammates Kirk Muller and Vincent Damphousse, Recchi tried to chase down a dump-in less than two minutes into the contest and Hextall greeted him with a solid body check. LeClair opened the scoring with a pair less than six minutes apart, his seventh and eighth goals of the season, in the middle portion of the second period, one of those on a clean break up the middle off a Mikael Renberg pass. Shjon Podein's marker 25 seconds into the third tripled the visitors' advantage, then LeClair sent the "home" fans into a frenzy, and they displayed their appreciation by showering the ice with token chapeaux in mock celebration. Kevin Dineen and Desjardins followed with their first goals of the year and the not-yet-revealed-to-be-disappointing prospect Patrik Juhlin capped the rout on his goal that chased Roy with 9:02 left in regulation. LeClair finished the evening with a game-high seven shots on goal and the sweetest revenge. "He's fired up right now," Murray said of LeClair to the Inky's Gary Miles. "Trades do that to people. We're very happy that he's excited. We're very happy that Eric Desjardins is excited. He's played extremely well since he's been with us. (Gilbert) Dionne is doing a really job good. He's going to break loose. The deal was good for us." The Canadiens, under Jacques Demers and who had been 5-0-2 on home ice to that point, remained tough at home and finished 15-5-3 at the Forum. Their dismal 3-18-3 mark on the road doomed the club to a sixth-place finish in the Northeast Division and they missed the playoffs for the first time since 1970. The immediate aftermath was the Habs lost five in a row and went winless in six, scoring just seven goals total. Spurred by the new additions, the Flyers started out on a 10-1-2 surge which rocketed them from fifth place to first place in the Atlantic Division across the span of 3 1/2 weeks. 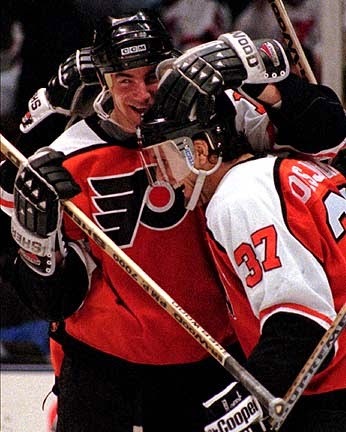 Not coincidentally, the final game in the run, on March 20 at the Spectrum, was an 8-4 thrashing of Roy and the Canadiens where Lindros netted the second of back-to-back hat tricks and the Legion of Doom rolled to nine points. LeClair had points in 12 of those 13 contests and compiled up seven multi-point efforts in that span. He finished the year with five goals in three games against his former club, which didn't end up beating the Flyers again until October of 1996 in their new building -- now called the Bell Centre.